"Your attention to detail and the step by step instructions were invaluable. I too was cynical about your 100% success rate, but the proof is in the pudding"
Tim and I can’t thank you enough for guiding us through the visa process. Tim’s visa was granted in late January and she and her daughter arrive in Los Angeles on March 11. Your attention to detail and the step by step instructions were invaluable. I too was cynical about your 100% success rate, but the proof is in the pudding. I know Tim and Oil appreciated your staff’s care and support. In only a few days my family will arrive and we will begin a new and exciting life together. Thank you again for making my dreams a reality. 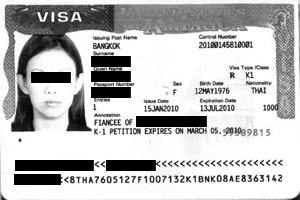 I would heartily recommend U.S. Immigration Legal Advisors to anyone wanting to bring their Thai sweetheart back home. p.s. I would be happy to share my experience with prospective clients. "I would whole-heatedly recommend your firm to anybody wishing to bring their Thai fiancee or wife to America. I would caution any body who thinks it is easier to do on their own and save some money. Your fees are more than reasonable, and obtaining a success"
"Toy and I are very happy with your personal and professional handling of the K1 fiancee visa and K2 child visa process"